It may seem shocking to contemplate, but Paris, although the "City of Love," is home to as much crime as any other big city. 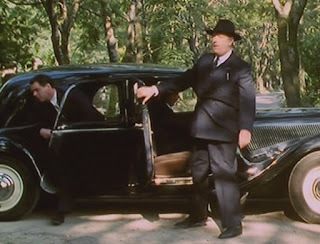 Luckily, the French have Chief Inspector Maigret (pronounced MAYgray) on the right side of the law. 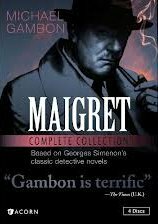 In Maigret: The Complete Collection, we get to see the wily detective investigate crime in post-WWII Paris and keep the criminals in check. This 4 DVD set contains all 13 episodes of seasons one and two of the series, filmed in 1992-3. Maigret is played by actor Michael Gambon with a sense of flair and dedication. Maigret doesn't miss much as he interviews witnesses, instructs his subordinates and tries to avoid his boss, the demanding and unimaginative Comeliau. Maigret finds, much to his chagrin, that the crooks and thieves are generally much more interesting people than those he works with. Maigret's wife dreams of a quiet retirement in the countryside, but it doesn't seem as if that's going to happen for a while. Maigret is a very renowned and sought-after detective. His exploits are covered frequently in newspapers, and he wherever he goes, people recognize him. He's often called out to the countryside to investigate crimes that happen there, too. Naturally, he's never stumped! In the course of his investigations, he gives as much weight to the information passed to him by known thugs, burglars, and prostitutes as he does to that received from "honest" citizens. My favorite episode was "Maigret and the Mad Woman." An elderly woman comes to Maigret with the distressing tale of someone entering her home while she's out and moving her belongings around. Nothing is ever missing, so everyone believes the old lady is merely mistaken -- until she turns up murdered. Why her belongings turned up in odd places was an interesting aspect of the case. The one thing that really stood out for me in the episodes (I tend to get distracted by details) was the constant smoking of the characters. 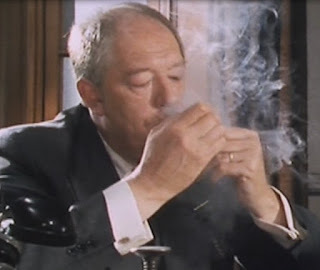 I guess it did fit in historically with the time period, and I suppose in those pre-cell phone days that actors needed something to do with their hands, but it was distracting to see a cloud of smoke wafting up in every scene. The period details are also very interesting, with the cars especially attracting attention. I was intrigued by how the front and passenger doors opened in opposite directions! You have to wonder how many times those doors banged into each other when the police exited the cars in a hurry. In addition to the DVDs, this set also contains a small booklet with information about the author, the character of Maigret and the TV series. The author Georges Simenon became the most successful non-English crime writer in the 20th century. Like many of his contemporaries, his life was changed by World War II, and while he continued to have a successful career in France, his questionable dealings with the Nazis led him to emigrate to Canada and later the United States following the war. He continued to have a successful writing career when he began setting his novels in the U.S. Ultimately, he became known as much for his somewhat scandalous love-life as for his writing! I really enjoyed discovering this new (for me, anyway) detective and seeing the lovely French settings. It's nice to know that the citizens of post-war France had such an astute and clever crime fighter on their side.